I'm happy to be joining everyone over at Gypsy Fish Journal for Silver Sunday, stop by and take a look at all the beautiful silver being shared. After being married for 46 years, many of those lovely wedding gifts of sheets, towels, kitchen linens, funky vases so popular in the 1960s have long ago left our care. The silver endures and carries memories of many happy times along with its warm glow. 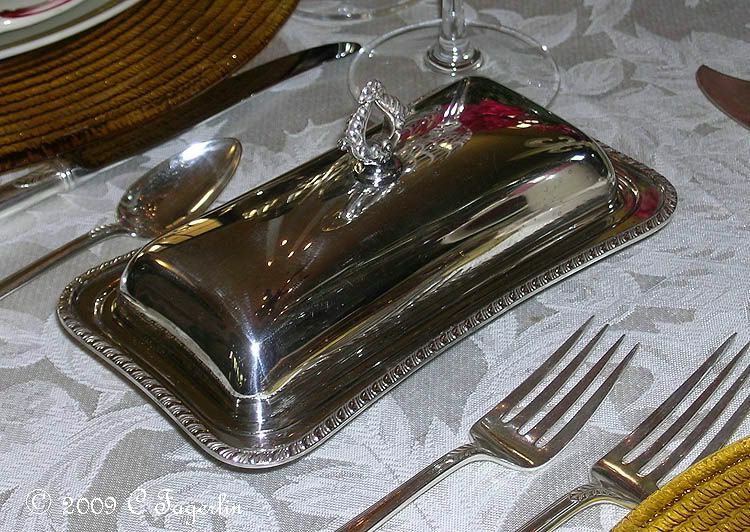 The silver tray, and butter dish were wedding gifts, the pie server belonged to my parents. A couple of these pieces have appeared here on The Little Round Table before and can be seen on the post entitled Those French Plates from November 2009. Hope to see you all again next Sunday for more shiny bright pretty things! How wonderful that you still have the beautiful silver pieces from your wedding. They are in excellent condition! Beautiful pictures too. You are so right, silver is timeless..your pieces are gorgeous! I love your servers...Thanks for sharing! So sweet...love your butter dish.. Thank you ladies, for your nice comments and for stopping by here at The Little Round Table! 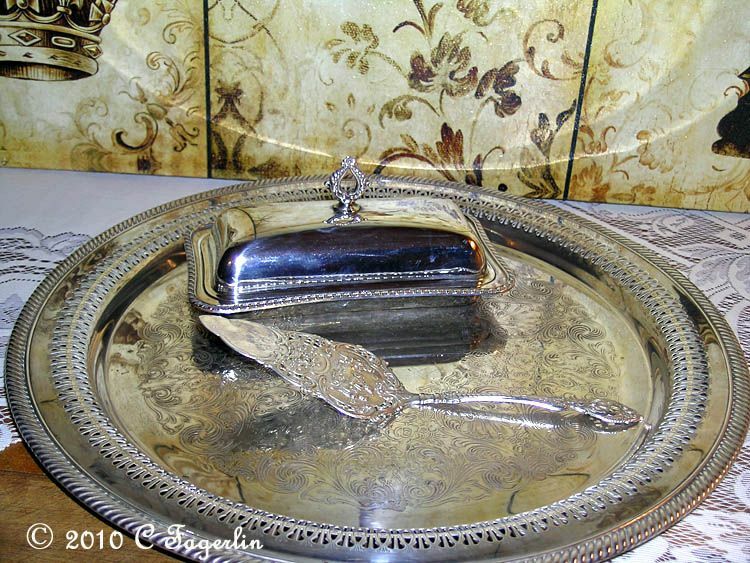 Love the butter dish...one of the items I would love to find in my thrifting jaunts! Timeless... so true... Thanks for sharing, Happy Silver Sunday. It's wonderful that you still have those items! I love your butter dish! I recently found your blog and want to tell you how much I am enjoying it. I especially love your silver pieces, and "Those French Plates." I was intrigued by "Those French Plates," and did some searches on the internet for them. I believe that I have found your plates, and they are from the company, Sarreguemines. If you will do some searches on Google, you can learn more about the company, and in the images you can see your exact plates sold on Ebay in France. I found your plates for sale at hollylaneantiques on the internet, and they sell for $125.00 each! The site says that they are dated to the 19th century. I love the silver, but really like your colorful banner on your blog. Very nice! Gorgeous silver pieces. Happy SS to you! I love your silver pieces. I've started using mine more, having been inspired by all of the beauty I'm seeing on the blogs out here in blogland. Yours are beautiful pieces. Thank you all for stopping by! The silver really brightens things up on these dark winter days and I find I'm so enjoying using them. 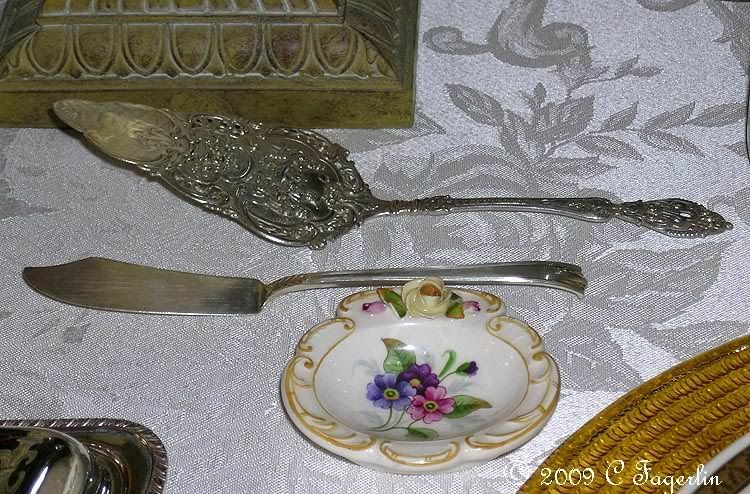 A special thanks to buckeyesue for the ID on "Those French Plates". It really made my day/week. I'll be doing a follow up post sometime soon with the additional info. Sherrie - I'm glad you like the new banner, had an itch to change it recently and probably will do so again in a couple weeks. Yea! I am such a fan of sterling silver and I'm glad to see you reserved a little space for these treasures amidst your color Fiesta collection. You hit it on the head. Silver carries with it both a coolness and a warm glow. Plus, the happy family memories attach themselves to these heirlooms. I am forever amazed at the artistry of silversmiths. A work of art is a joy forever.